Hello and welcome to Raring2go! 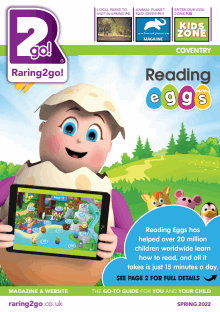 - your local guide for what to do and where to go with your children in the Coventry and Nuneaton area. There's so much going on in our local area - so if you're looking for a local class, planning a fun day out for the family, need inspiration for a party or more then look no further! If you're wishing to feature your own events, activities or family friendly businesses then please contact me by email for details. Don't forget that you can add details about your own event HERE. You can also follow us on Facebook and Twitter for hot-off-the-press updates and information on our favourite local events, competitions and offers for local families, so to stay in touch just 'like' our page! A verification email has been sent to the email provided. This contains a link you'll need to follow to complete the subscription. Join our FUN self defence classes for 4-6 year olds or try taekwondo for the whole family on a Sunday!! Homework is a constant battle...but there are things that can be done to make it go more smoothly! Our KidsZone is packed full of activities for indoors and out, plus loads of colouring in and activity sheets to download and print off. Fed up with the same New Year Resolutions? Here's some ideas with a difference for the whole family! Finding money for family days out can be tough, but there are savings to be made if you hunt around. A fun-filled day (or two!) at the Ironbridge Gorge Museums promises to keep all the family happy.